FILE - Royal Palms Beach in the San Pedro area of Los Angeles is protected by boulders placed there to forestall erosion. White House officials say President Donald Trump will sign executive orders Tuesday that would effectively dismantle Obama-era environmental regulations, rekindling the highly charged partisan debate about how human activity affects the earth’s climate, and deepening concern decades of work on global climate treaties may be unraveling. “Many agree that would be disastrous,” Dutch Nobel laureate Paul Crutzen told VOA in a telephone interview. “Whatever has been achieved could be destroyed, so I don’t think many scientists would be pleased with this,” said Crutzen, who won the 1995 Nobel Prize for work explaining the depletion of the earth’s ozone layer. White House press secretary Sean Spicer said Tuesday the move by the president will free up companies to "use our vast energy resources." 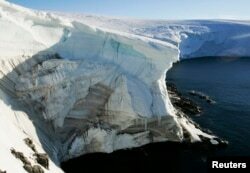 FILE - A record-size hole in the ozone layer has appeared over Antarctica. Shown here is a cliff face at Landsend, on the coast of Cape Denison. A senior White House official told reporters late Monday that Trump believes he can balance twin goals of protecting the environment while also promoting energy production in the U.S., and that economic factors are the main consideration behind the executive orders. "To the extent that the economy is strong and growing, you have prosperity, that's the best way to protect the environment," the official said. Trump is directing federal agencies to identify rules the administration says impede domestic energy production, as a first step in a six-month process to create a blueprint for the administration's future energy policy. The senior official said that while the president's order will be scrapping many of former President Barack Obama's environmental initiatives, the government will continue to enforce "plenty of rules" on clean air and water that Trump believes should be the core focus of the Environmental Protection Agency. Trump has repeatedly signaled disdain for his predecessor’s climate policy. On the campaign trail he called President Obama’s Clean Power Plan "stupid", largely because it puts in place what he calls "job-killing" regulations. The executive orders he is set to sign Tuesday directs the Environmental Protection agency to thoroughly revise regulations outlined in the Clean Power Plan. 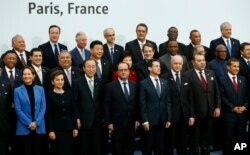 FILE - French President Francois Hollande, front center, poses with world leaders for a group photo as part of the COP21, United Nations Climate Change Conference, in Le Bourget, outside Paris, Nov. 30, 2015. Early drafts of the executive orders were said to have included language critical of the Paris deal. News reports, however, say two of his closest confidants, daughter Ivanka and Secretary of State Rex Tillerson, a former chief of the global energy giant ExxonMobil, intervened to have references to the Paris Accord dropped from the final draft. The senior administration official said Monday that whether the U.S. sticks with the Paris agreement is still under discussion. The EPA’s Pruitt said Sunday that revising the Clean Power Plan is aimed at unshackling American industry. “This is about making sure we have a pro-growth and pro-environment approach to how we do regulation in this country,” he said. Leaked details of the executive orders have ignited a firestorm among climate scientists. Sierra Club Executive Director Michael Brune called Trump's order "the single biggest attack on climate action in U.S. history, period." Brune said the action ignores the growing clean energy economy that serves as the best way to protect both workers and the environment. In Washington views on climate change generally split along party lines. With Republicans controlling the White House and both chambers of Congress, the views of climate skeptics, largely marginalized during the Obama years, are finding fresh voice. 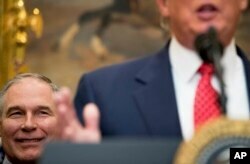 FILE - EPA administrator Scott Pruitt listens as President Donald Trump speaks before signing the Waters of the United States executive order, Feb. 28, 2017, in the Roosevelt Room of the White House. EPA chief Pruitt was known for numerous legal challenges to EPA regulations when he was attorney general of Oklahoma. His official biography describes him as "a leading advocate against the EPA's activist agenda." On Capitol Hill, the House Science Committee has scheduled hearings this week to look into the methods of climate scientists, as Chairman Lamar Smith (R-TX) pushes forward a bill to require the EPA to make public the data it uses to justify environmental regulations. The hearing will feature three prominent academics who question the scientific consensus, alongside Michael E. Mann, director of the Earth System Science Center at Penn State University and author of the “hockey stick” graph that suggests a steep rise in the earth’s temperature since fossil fuels came into wide use. Speaking to VOA, Mann said the rising profile of climate change doubters in Washington is part of a well-funded campaign by big energy industry interests, mainly Charles and David Koch, who are major contributors to conservative political and policy groups. “Trump’s administration has been filled with individuals who have close ties to polluting interests, ExxonMobil obviously, but the Koch brothers, the largest privately owned fossil fuel interests in the country,” Mann said. “... and their agenda has long been to gut all government regulations so they can increase their own profits from the sale of fossil fuels." Climate skeptics agree money has corrupted the scientific debate, but they differ on its effect. The dissenters argue that fierce competition for the billions of dollars in government research grants has forced academics to exaggerate the danger of climate chance. Richard Lindzen, professor emeritus of meteorology at Massachusetts Institute of Technology, represents the small minority of scientists who find fault with the overwhelming consensus on climate change. He argues universities have given in to the temptation to exaggerate climate change as they have become increasingly dependent on billions of dollars in government research funding, effectively making bureaucrats the real judges of science. "We went way backward in studying climate and replaced it with this single variable, (CO2) and increased funding by 1500% and created a whole new community that had never studied climate but was willing to attribute everything to it," he said. Lindzen supports Trump’s initiative to limit funding for climate change research. “Then only people interested in the physics of climate change would remain,” he said.